The Nobel Prize is one of the biggest prizes in the world. Dr. Strickland will share the prize with Dr. Gérard Mourou of France and Dr. Arthur Ashkin of the United States. 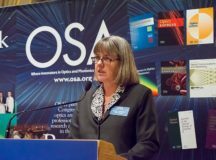 All three scientists won for their work creating tiny (miniature) tools using lasers. The prize is $1.28 million. It will be divided among the three scientists. Half the money will go to Dr. Ashkin. Dr. Strickland and Dr. Mourou will share the other half. On October 17, the Cannabis Act came into force and cannabis became legal for adults in Canada. The recreational drug, also known as marijuana or pot, is often smoked like a cigarette. It is still illegal to buy or use pot in the United States (except in rare cases such as for medicinal use). Children may not legally buy or smoke pot; it is not healthy for bodies and brains that are still growing. It is also illegal for anyone under 18 years old to purchase cigarettes. 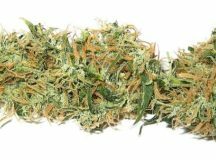 Only adults, 19 years of age or older, may legally smoke pot. They can also legally buy it and grow marijuana (for their own use, not to sell). Banksy has done it again. Banksy is a world-famous artist, but no one knows exactly who Banksy is–or even if Banksy is male or female. That’s because Banksy is a “street artist.” Most of the art Banksy creates is painted on the sides of buildings, public walls and other places that are out in the open. And the art is created without anyone seeing them being created. So Banksy has remained anonymous (meaning that no one knows who it is). Banksy’s art is “political.” That means it’s not just interesting to look at, but it makes a point about something. One of Banksy’s most famous paintings is called Girl with Balloon. It was painted in 2002 on a wall in the UK. 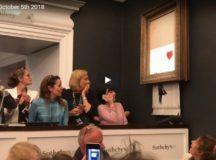 Recently, a framed copy of Girl with Balloon was auctioned off (sold) for nearly two million dollars. A big agreement was just made between the United States, Canada and Mexico. It’s complicated–too complicated to explain fully here–but it’s good to have an idea about what it is and why it is important. Back in 1994, the US, Canada and Mexico made a deal to all become “trading partners.” That means, each country would partner with the others to make it easy to buy and sell things and services back and forth. That deal was called NAFTA, the North American Free Trade Agreement. When countries don’t have a deal like that, it’s sometimes hard for one country to sell things to another country. Lots of medics and emergency workers are helping people in Indonesia after a large earthquake happened there on Friday. The earthquake also caused a tsunami. That is a massive wave of water. When an earthquake happens on or near a large body of water, it can cause huge waves and flowing water that does a lot of damage. 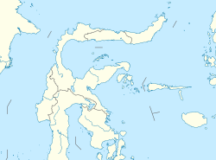 The earthquake in Indonesia was along the coast, near a city called Palu, which is on a bay. Many people helped those who were affected by the disaster. In June, the province of Ontario got a new premier: Doug Ford. His political party won the election in a landslide and has a “majority government.” That means the party Ford leads has more votes than all of the other political parties put together, and it gives them a lot of power to get things done. 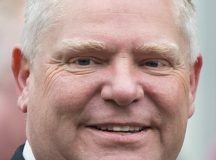 Recently, Ford and his party used that power in a way that has upset some people. It all began when Ford announced that he was going to reduce the number of city councillors in Toronto from 47 to 25. Toronto is one of the largest cities in Ontario. Ford says having fewer councillors will make the city run better. But people who don’t agree with Ford say he is only doing it because he doesn’t like some of the Toronto councillors. They say it’s not a business move–it’s personal. Twenty-year-old Naomi Osaka won the US Open tennis tournament (Women’s Singles) on Saturday. Osaka, who is Japanese-American, is the first Japanese person to win a major tennis tournament. However, her win isn’t the only thing that made the tournament memorable. Something happened to her opponent, 36-year-old tennis star Serena Williams. She was accused of being “coached,” which is not allowed during a match. Williams’s coach, who was sitting in the crowd, had made a motion with his hands to tell Williams how to hit a shot. However, Williams said she was not looking at the coach at the time and so did not cheat. 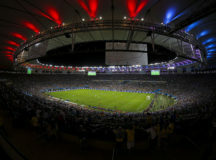 The FIFA World Cup, the biggest event in men’s soccer–perhaps in sports, period–will be co-hosted jointly in 2026 by Canada, Mexico and the United States. Each of the three countries will host some of the games. One proposal is for Canada and Mexico to each host 10 games, and for the United States to host 60 games. Canada hosted the women’s world cup in 2015, one of only four countries to host both events. 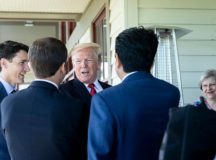 A lot happened at the G7 summit this year. The G7 (the G stands for “group”) is made up of seven of the world’s wealthiest countries: Canada, France, Germany, Italy, Japan, the United Kingdom and the United States. The leaders of these countries, plus representatives for the European Union, get together every year. That meeting is called a summit. Every summit is held at a different G7 country; this year, it was held in Quebec, Canada. At the summit, the leaders talk about issues that affect them all. This year, Canada’s Prime Minister, Justin Trudeau, said he wanted to discuss: strengthening the middle class, supporting women’s equality and ensuring that more girls can access education, dealing with global warming and promoting respect for diversity.